A massive flyover ramp may have to be be built over the Dunn Loring Metro Station in order to accomodate the new express lanes along I-66 in Northern Virginia. News4 Transportation Reporter Adam Tuss has new details and reaction. Express lanes are coming to Interstate 66 outside the Capital Beltway -- but a major hurdle has come to light that could drastically change the project. 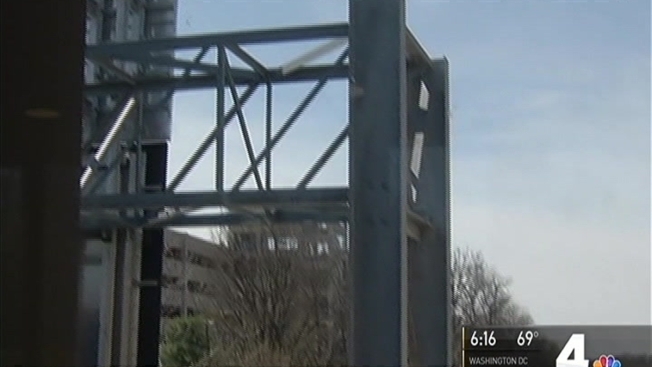 Part of the Dunn Loring-Merrifield Metro station in Vienna, Virginia, is in the way of the I-66 expansion project, specifically the power station that is right next to the interstate. Project planners with the Virginia Department of Transportation said the Dunn Loring power station will either have to be moved or a large flyover ramp with go above that stretch of road. "It would need to be about 30 feet above existing Gallows Road and then we don't know if we would need to put sound walls the ramp itself. That could add to the elevation there," said Susan Shaw, with VDOT. Resident Deana Heier said the plans have simply been dropped in everyone's lap. "You can imagine this ramp is going to go right over - an interstate is going to go right over where we walk," Heier said. "To see a new ramp pop up that's going to go right up over where we shop and walk, it just tells us that they didn't get it the first time." No final decision has been made, VDOT said. "For the region, it's really important to solve this right from a traffic standpoint because if you have a bottleneck right at the Beltway, your entire system is just not going to flow well," Shaw said. A series of public meetings are scheduled for mid-June and construction on the overall project is set to start this year. Visit VDOT's website for more information about the meetings.